How long in the dark for HM110? This morning I got up early and ran my easy 5miles before work. As I ran I thought about when will it get dark on Saturday 24th May and when will it get light again the next morning. So I’ve just had a look on bbc weather and for Saltburn it says sunset 9.15pm and sunrise will be at 4.45am. I’m sure it will light for a bit longer than 9.15am and it will be getting light before 4.45am. So I reckon we’ll have about 7hrs of darkness. When I ran with Dave for our two day recce we chatted about where we might be when it gets dark and where we will be when it gets light. If I’m around my 27hr plan then I reckon I’ll be somewhere between Saltburn and Skinningrove when I’ll need to put my head torch on. Then I’ll be able to switch it off as I approach Ravenscar! I wonder how accurate that will prove to be! 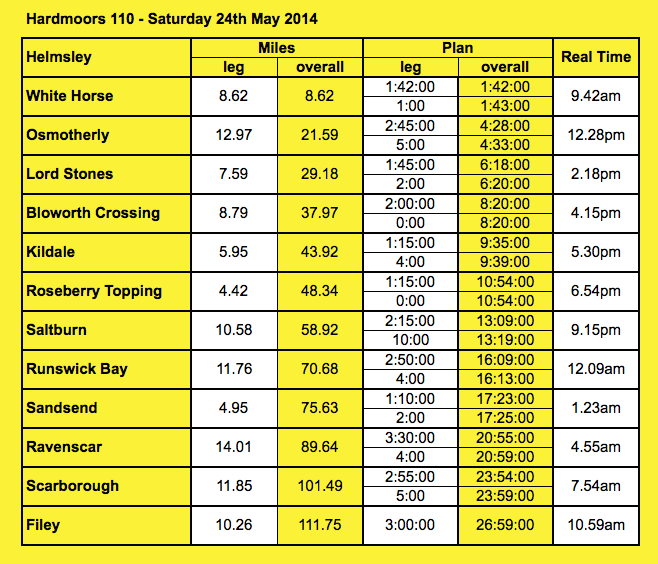 This entry was posted in Easy run, Hardmoors 110. Bookmark the permalink. 1 Response to How long in the dark for HM110?